Elections tend to be a surreal time, what with motormouthed candidates perpetually promising a chicken in every underfunded classroom and gasoline pumps that shoot champagne instead of petrol. Here are eight times politicians channeled the realms of science fiction, horror, and fantasy for the express purpose of confusing the (already perplexed) electorate even further. In 2011, comic book store owner and Spokane City Council candidate John Waite campaigned for public office while occasionally dressed as a Starship Troopers-esque space marine from the popular science fiction computer game Starcraft. Waite didn't win, leaving his presumed campaign platform of "more co-ed showering scenes" sadly unfulfilled. In 2006, filmmaker Christopher Knight ran for the Rockingham County, North Carolina Board of Education while wielding a Jedi's chosen weapon and hanging out uncomfortably in the deserts of Tatooine. Despite the sizable media attention this ad attracted, Knight's Jedi mind tricks failed to persuade voters. Not to be outdone by Christopher Knight, in 2010, Democratic West Virginia governor Joe Manchin ran against John Raese with this Microsoft Paint-like masterpiece. The ad culminates with Manchin destroying a crudely animated, hummingbird-sized TIE fighter with rifle. (He won the election, incidentally.) Here are more of his low-budget campaign spots. This ad by Republican California Congressional candidate John Dennis debuted a few weeks back. In this spot, a Nancy Pelosi impersonator tries to sacrifice a lamb to her undead supporters, but Dennis swoops in and saves the day. My favorite part is when Dennis and the lamb strut off into the sunset together. This isn't exactly an ad, but it is germane to this particular topic. Several weeks ago, Barack Obama's campaign debuted (and then quietly scrapped) a poster that superimposed his campaign's logo over the American flag. This fellow here — who also had some strong words for the Denver International Airport — breaks down the Satanic subtext — with turkeys! In 2010, then 80-years-old New Orleans coroner Frank Minyard faced this bizarre commercial from then 68-year-old challenger Dwight McKenna, who accused Minyard of selling organs for a profit. 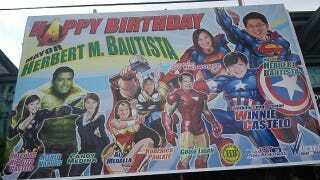 Earlier this year, Quezon City mayor Herbert Bautista received this weird, copyright-be-damned billboard birthday card from his city council allies. My favorite part is the guy whose face was more or less taped onto Thor's body. BONUS: Batman and Robin, running for office in Brazil.